Here is a new to me brand, Eat.Sleep. Polish. - Painting the Roses Red. 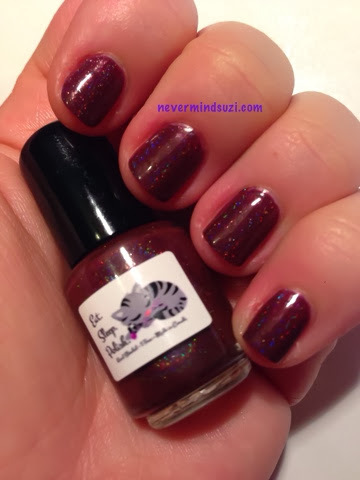 I discovered this brand during the #sharethelove for bloggers and indie makers alike on facebook a few weeks back, and when I saw they had not only an Alice Collection but mini's I knew I had to try them out! 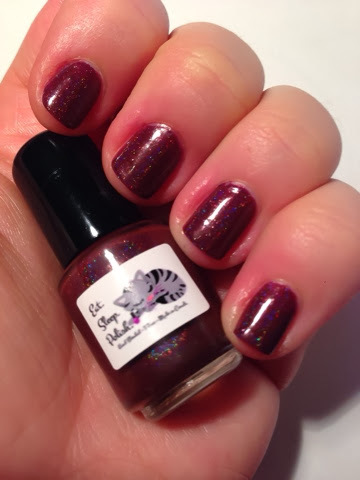 Painting the Roses Red is a burgundy holo. A rich, deep, almost blood red. With a not-so-subtle holo shimmering through it. I'm wearing 3 thin coats here as 2 was a little streaky on some nails. Love this polish and such a vampy colour the Red Queen herself would love it!